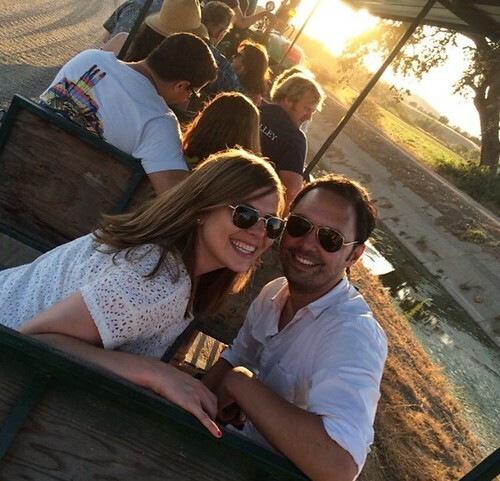 These two met at a Capay Tomato Festival and haven’t missed our annual event since. A little birdy told us they are now engaged! Congratulations Max and Reamonn!! We are looking forward to seeing you again Saturday, July 16th for our 9th annual Capay Tomato Festival. We've got a few more stories we'll be sharing over the next few weeks of how friends, families and folks who’ve never met before have celebrated and found love on our farm. It’s an honor that you, our community, share these everyday extraordinary moments with us. In general, Gavin and Lilly did a lot of falling in love on the farm. Gavin lived on the farm and would travel to SF on weekends to see friends - and that's when he met Lilly. They were at a mutual friend’s birthday party where he offered her a Candystripe fig from the farm. One fig led to another, and they spent most of the party exchanging summer stories and dancing until the wee hours. Soon she started making trips out to the farm for events, to harvest fresh veggies and fruits, cook, enjoy the natural beauty and hang out with Gavin's cousins - Noah, Thaddeus and Freeman, 2nd generation owners of Farm Fresh To You. 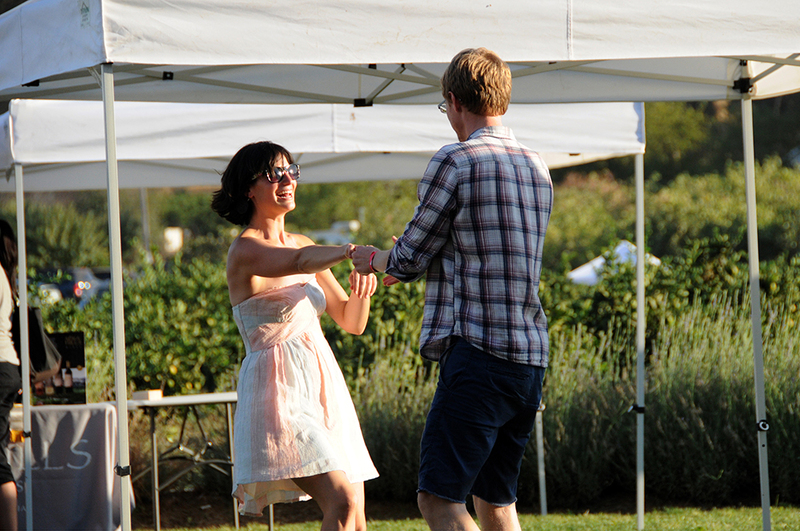 This summer they are getting married on the farm - the perfect place for their wedding! We couldn't be more excited! Do you have a story of love shared or found on our farm? If so, we’d love to hear about it! Just leave us a comment below. Fresh, juicy peaches are a special part of summer, and make a great addition to this refreshing punch. Try it as a non-alcoholic beverage or with a splash of rum or vodka. Bring water to a boil in a small saucepan. Add tea bags, remove from heat and let steep for 15 minutes. Meanwhile, peel and pit three of the peaches. (We used a vegetable peeler, but you can also use a knife to peel them). Toss the peeled peaches in a blender with the lemon juice and puree until smooth. 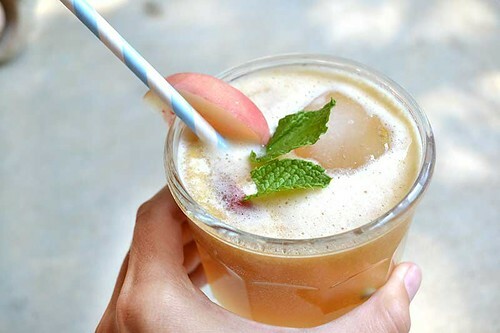 Cut the remaining peach into slices and combine in a pitcher with the peppermint tea, peach puree and ginger beer. Fill two (or more) glasses with ice, pour in the punch and garnish with mint (optional). How To Add Peppermint Peach Punch Ingredients To Your Delivery: CSA members - head on over to our online Farm Stand Market to customize your upcoming delivery. The Market is open from noon on Thursday until 10 am, 2 days before your scheduled delivery day. After you confirm your produce items, click the orange button "Confirm and Continue To Other Farm Products" to add the products to your delivery. Not part of our farm family? Find out if we deliver to your neighborhood. The dry trailer was at the end of its life. For years and millions of miles, it had been coupled to a semi and hauled an untold amount of things to as many locations. On the side of it, the paint had faded in the shape of the logo of the freight company that no longer needed the 53’ trailer with wood floors and swing doors in the back. We get a lot of questions from our members about chicken eggs. Everything from wanting to know what the chickens are fed, where they sleep and which eggs will have the richest flavor. With so many different labels for eggs, such as organic, free-range, and pasture-raised, it can get a bit confusing to decipher the best choice for your family. This blog will help you navigate the loose definitions, the different options available through our delivery service, highlight the benefits of each option and provide you with our best recommendation. Definition: Hens must be given organic feed, which contains no synthetic pesticides, herbicides, or fungicides and no GMOs or animal by-products. They must never be caged, and they are given some sort of outdoor access, although the parameters are not well defined. 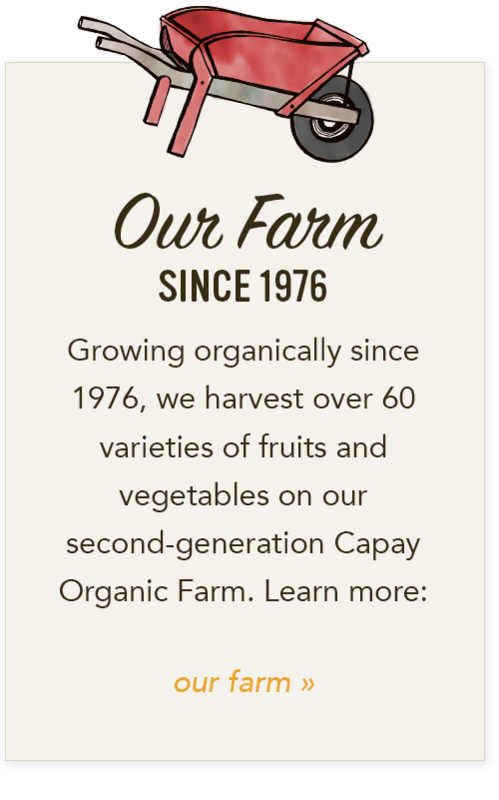 The organic, cage-free eggs offered in your Online Farm Stand come from Judy’s Family Farm located in Petaluma, CA (for northern CA customers) and Chino Valley Ranchers in Colton, CA (for southern CA customers). The laying houses include comfortable nests where the hens can lay their eggs in seclusion since even hens like a little bit of privacy. Hens also enjoy roosting slats, similar to a tree and have free access to food and water. 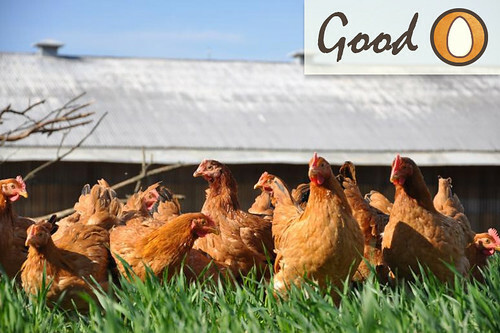 These hens are raised without antibiotics or hormones and are fed an organic, vegetarian diet. Both farms do not clip the wings of their chickens. 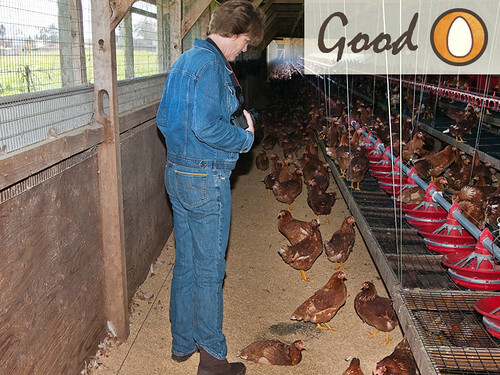 At Judy’s Family Farm, the eggs are produced in hen houses that allow the sun to shine in and use 100% natural ventilation, except during the cold winter months when the hens need protection from the elements. 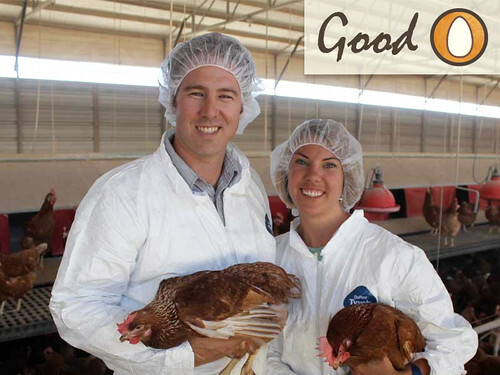 Chino Valley Ranchers’ hen house environments are controlled in order to protect their hens from the outside elements. The flocks are protected against disease with vaccinations. Sold for $5.99 per-dozen. Definition: Hens must live in an open space, not a cage or a coop, but the "open space" can be inside large aviaries or barns. Birds do have some degree of outdoor access—though the amount, duration, or quality of that outdoor time is not specified. The egg is described as fertilized because the hens have access to a rooster. The free-range, fertilized eggs offered in your Online Farm Stand come from Vega Farms in Davis, CA. 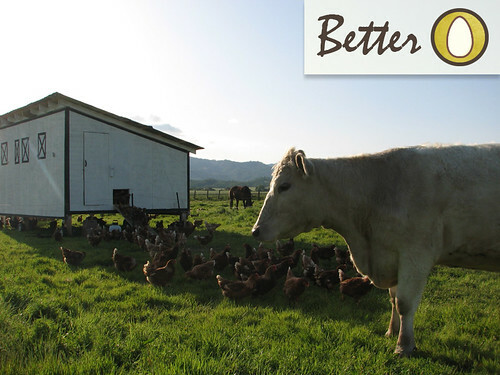 These hens enjoy access to a strip of outdoor pasture alongside their barn, a clean shelter with wood shaving bedding and a constant supply of fresh, clean water and feed. At night, the hens sleep in the barn to protect against natural predators. The eggs are described as fertilized because the hens have access to a rooster, but their eggs will look and taste just like an unfertilized egg. Although they do eat grass and bugs, the majority of their diet comes from a vegetarian corn and soy-based feed that is not certified organic. Vega farms doesn't clip wings or force their hens to molt. They also don't use hormones, antibiotics, animal by-products or additives of any kind, and their flock is protected against disease with vaccinations. Sold for $6.99 per-dozen. Definition: Hens are allowed to range on fresh pasture. Often they are housed in mobile trailers that can be towed to different fields. Most often the hens are given feed to supplement their diet. The pasture-raised eggs offered in your Online Farm Stand are raised by our farm, under the brand Che’s Free Flying Eggs (in honor of our late brother Che). 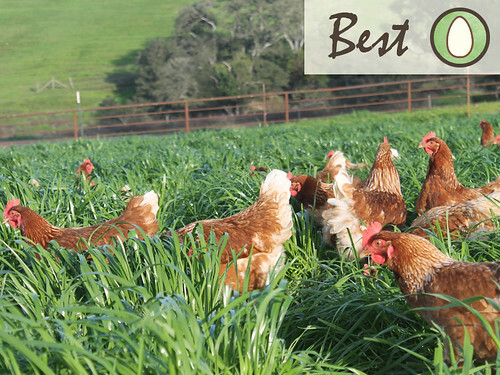 Located in Yolo County, these hens enjoy unlimited access to green pastures and orchards during the day, foraging on grass and bugs to their heart's content. The natural grazing makes for dark orange yolks that are rich in flavor and more nutrient dense than hens limited to store bought feed. At night, the hens walk into their custom-built, mobile chicken homes for a safe and comfortable night. The hens are offered organic fruit and veggie leftovers from the farm and their diet is supplemented with feed. While the feed is not certified organic, it is domestically grown, and includes natural supplements like crumbled oyster shells for added calcium. Che’s Free Flying Eggs doesn’t trim beaks, clip wings or force the hens to molt. The flock is protected against disease with veternarian visits and vaccinations. Sold for $7.99 per-dozen. Definition: Hens are allowed to range on fresh pasture. Often they are housed in mobile trailers that can be towed to different fields. The hens are given organic feed to supplement their diet. 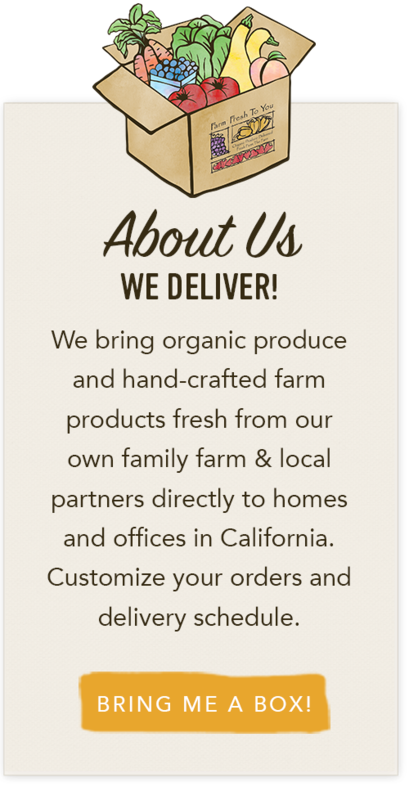 The organic, pasture-raised eggs offered in your Online Farm Stand come from Pasture Fresh Eggs located in Sonoma and Marin counties. In addition to their serene pasture-raised lifestyle, their diet is supplemented with organic foods and feed. The hens are never given antibiotics or hormones, and they are allowed to graze on grasses and feeds that are naturally higher in Omega-3s, producing an egg that is delicious, rich and naturally higher in Omega-3s. Pasture Fresh Eggs' approach to farming allows the chickens to act in their natural behavior; being able to run, jump fly, roll and dust their bodies in rich soils for natural skin protection. Their coops allow for ample perching and nesting to lay their eggs. Each flock has a mix of different breeds of chickens, which means that egg in your carton may be brown, white or a combination. This gives the eggs a unique look that is not typically found in the grocery store. Pasture Fresh Eggs doesn't clip wings or force their hens to molt and the flock is protected against disease with vaccinations. Sold for $8.99 per-dozen. While we highly recommend a pasture-raised egg option, our goal is to provide you with a variety of good options and enough information to make the right choice for your family and lifestyle. We support farmers that are working hard toward sustainable practices that will leave a positive effect on our livestock, ecosystem and personal health. 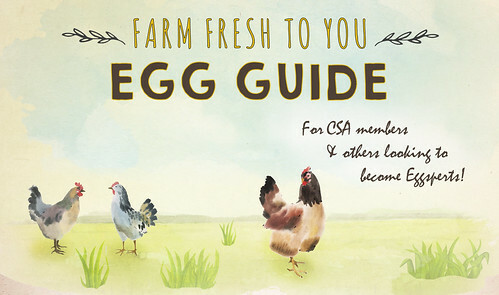 How To Add Eggs To Your Delivery: CSA members - head on over to our online Farm Stand Market to customize your upcoming delivery. The Market is open from noon on Thursday until 10 am, 2 days before your scheduled delivery day. After you confirm your produce items, click the orange button "Confirm and Continue To Other Farm Products" to add the products to your delivery. Hamburgers, buns, ketchup and mustard are summer staples, but for those who want to skip the meat, gluten, and traditional condiments, here are a few flavorful alternatives packed with farm fresh ingredients. 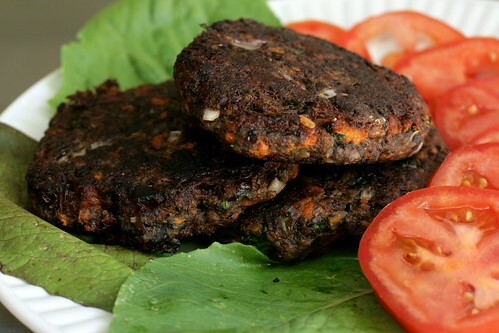 These burgers are grain free, vegetarian and paleo-friendly. Serve in a lettuce wrap with bruschetta jam, or on their own with a side salad. Double the batch and freeze some for later. To warm, simply defrost patties and fry in a little oil over medium high heat for 2-3 minutes per side. 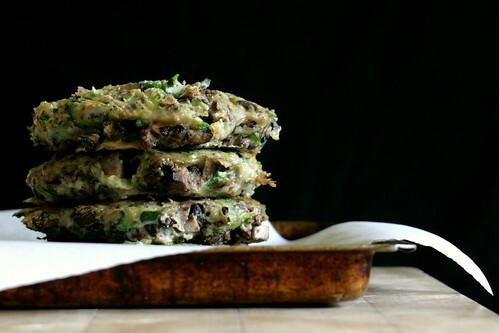 Spread grated zucchini and chopped mushrooms on a large cookie sheet. Sprinkle with salt and let sit for about 15 minutes to disgorge excess moisture from the vegetables. Gently squeeze remaining moisture from mushrooms and zucchini, discarding liquid. Preheat oven to 350. Line a large cookie sheet with parchment paper. In a large mixing bowl, beat two eggs. Mix in almond flour, minced garlic, thyme, black pepper and red pepper flakes, if using. Add mushrooms and zucchini and stir to combine. Using a half cup measuring cup, scoop batter onto the lined cookie sheet and gently form patties with your hands. Bake for 10 to 15 on one side, then carefully flip the patties and bake for 10 to 15 minutes on the other side. Burgers will take on a golden brown color as the egg sets up. Let cool before serving. Click here for a print friendly version. 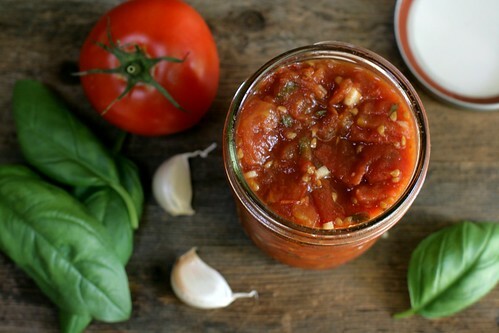 In a non-reactive sauce pan, combine tomatoes, sugar, balsamic vinegar, and salt. Bring to a boil, then adjust the heat to simmer for 30 minutes, stirring occasionally. Add garlic and basil and simmer for 30 additional minutes, or until mixture thickens. Allow to cool, and transfer to a sealed container. Jam will keep in refrigerator for 2 weeks. These vegan burgers are packed with flavor and texture. The natural sweetness of carrots and sweet potato are enhanced by roasting, and the chipotle pepper in adobo sauce adds a spicy kick. Top with cilantro pesto. 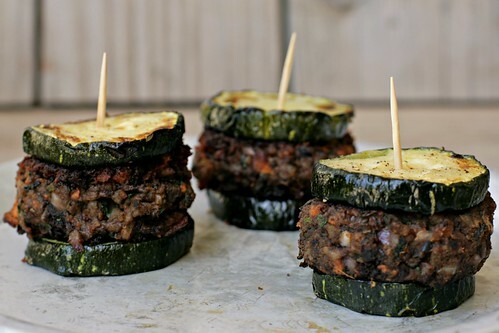 Consider serving as sliders on zucchini “buns”: simply slice a large zucchini in ¼ inch rounds, toss with olive oil, salt and pepper, and roast or grill. Preheat oven to 450. Toss diced sweet potato and carrots with olive oil, salt and pepper. Spread in an even layer on a cookie sheet and roast for about 20 minutes, stirring once for even browning. Let cool and softly mash with a fork into small chunks. In a food processor, pulse chipotle pepper and adobo sauce a few times, then add beans and rice. Pulse to blend, but do not puree. In a large bowl, combine red onion, cilantro, garlic, cumin, salt and pepper. Add roasted sweet potatoes and carrots, black beans and rice, and ground flax seed mixture. Stir to combine. Refrigerate mixture for several hours. If the mixture is sticky to the touch, add gluten free flour of choice, several tablespoons at a time, to the mixture to absorb moisture. The mixture should not be so sticky that it coats your hands when you form patties. Heat oil in a large frying pan over medium high heat. Scoop ½ cup of mixture at a time to form patties, or ¼ cup to form slider patties. Working in small batches, fry the patties for 2-3 minutes per side, until a brown crunchy crust forms. Serve warm. 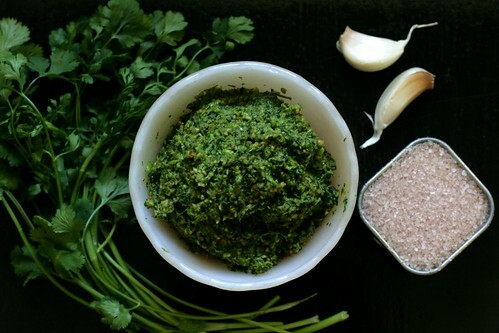 Combine pepitas, cilantro, garlic, salt and lime juice in food processor and pulse until coarsely chopped. Slowly drizzle in olive oil as you continue to pulse to desired consistency. Store in refrigerator for up to a week. Our farm has very telling signs of the season. It is interesting to note how easy they are to forget, but the first sight of a new season is so obvious. The turkeys by the farm’s creek have settled down. Gobbles in the evening and morning are no longer heard, and the presence of male turkeys with their tail feathers out for display is no longer part of an every-day farm experience. 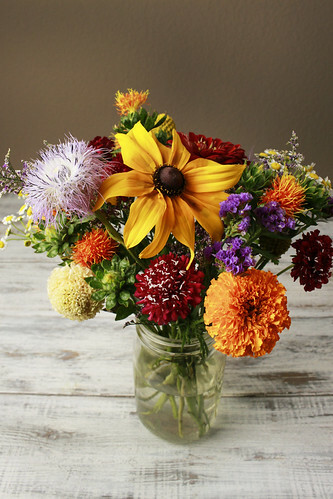 There is nothing like a bouquet of fresh flowers to brighten up a room – and your day! It’s been exciting for us to offer farm-fresh flowers to our deliveries over the last year. 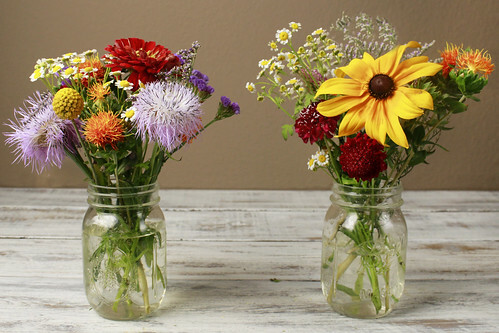 Most mixed bouquets will fit in a quart-sized mason jar, or separated into two arrangements to fit into two pint-sized mason jars. 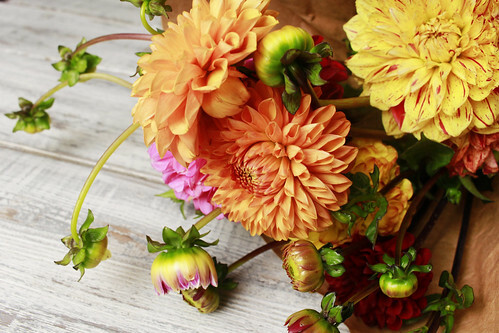 To enjoy your flowers for as many days of gorgeousness as possible, follow these 5 easy steps. Choose the best vessel for your arrangement. The height of the flowers should be in proportion to the size of the container. The flowers should not exceed one and a half times the height of the container. You also don’t want to overcrowd the flowers in the container either. Clean your container with hot soapy water to kill any microorganisms that can cause slimy water and dead flowers. 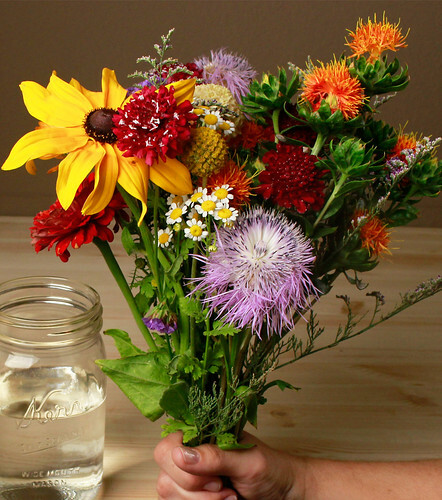 Fill your vase with clean, lukewarm water. Lukewarm water works best because it will travel up the stem of the flowers quicker than cold water would. You’ll want to give them a quick trim (about 1 to 4 inches off the stems) and get them into water as soon as possible – before you even think about arranging them. 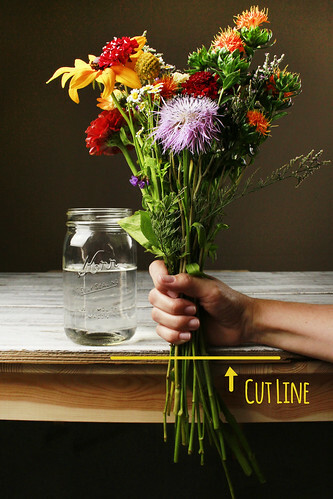 First, hold your arrangement next to the vase and compare the height of your arrangement with the height of your container so you know where to trim. 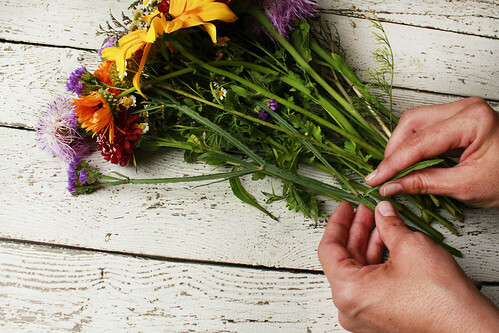 To get your flowers ready for the vase you’ll want to arrange them first. We suggest you view the flowers from eye level (not from above) and turn the flowers occasionally to view from all angles while you prepare them for your final vase. Distribute color, sizes and texture evenly. Pull taller, accent flowers to the center and arrange smaller flowers and filler around the perimeter. Be sure there is fullness and color on every side. Once you have the flowers arranged to your liking, you’ll want to re-trim each stem to the correct height to fit in the vase. 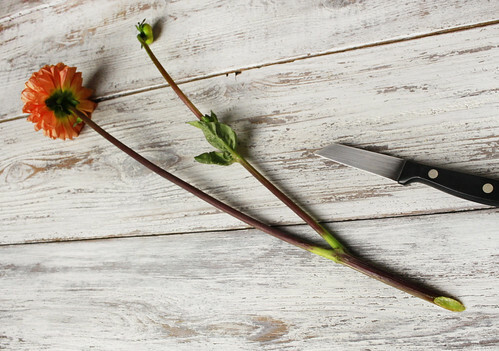 The tool you use to trim your stems is important. We recommend that you do not use ordinary household scissors as they may crush their vascular system and prevent proper water intake. The best tool is a clean, sharp knife or garden shears. 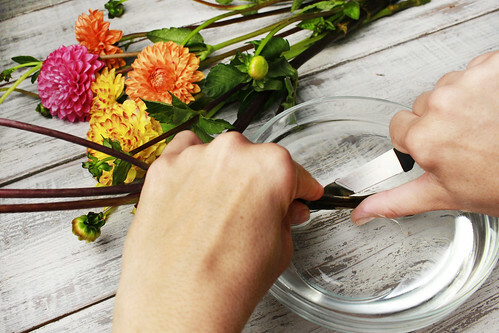 Trim the stems at a 45 degree angle in a bowl or under running water. Cutting at an angle provides more surface area for the uptake of water and it also creates a point for the stems to stand on, allowing for more water to be in contact with the cut surface. Cutting underwater prevents unwanted air from entering the stems and preventing a steady flow of water to feed the flower. *NOTE - You'll want to get the flowers into water right away, so limit the amount of time the newly trimmed flowers stay out of water before your final bouquet is finished. 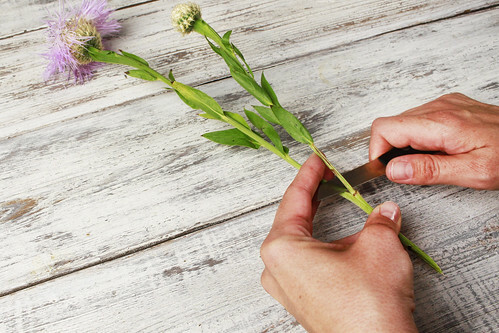 Trim each stem to the correct height – leaving them a little higher than you would want to allow for wiggle room and continued trimming throughout the week. Before placing in the vase, remove any wilted petals or leaves as well as any greenery from the stems that will be below the water line. This will help the healthy flowers to get more water as well as keep the water more clear. Place your arrangement into your vase and display in a cool spot, away from drafts, direct sunlight, heat and ripening fruit. 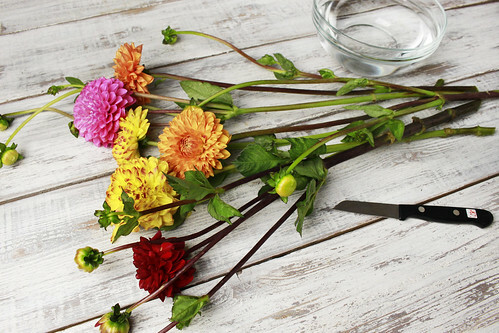 Discard any wilted or browning blooms or leaves. We advise you change the water and trim a bit more from the ends of your stems at least every other day to allow flowers to receive a steady flow of clean water. After a few days flowers may benefit from a light misting each day. Our farm has always been on the cutting edge of distribution systems that connect a farm’s produce directly to the consumer. It is a little known fact that the reason our farm started was because my Dad got the city of Davis to agree to let him use their insurance to start a farmers market. Once he knew that a farmers market was going to start, he found a quarter of an acre to grow some stuff to sell at the market! He was worried that farmers and the people of Davis wouldn’t take to his innovative idea right away, so he had better grow something. He needn’t have worried – people showed up to see what this new farmers market idea was all about. 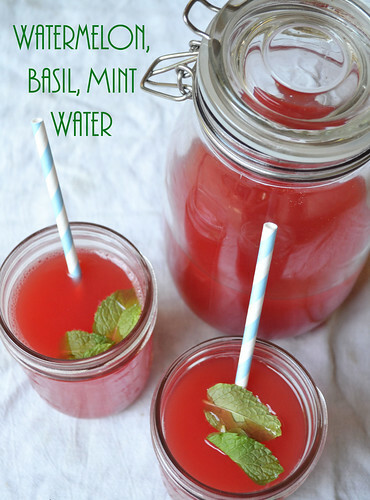 This watermelon water is super refreshing and a great way to get rid of watermelon if your watermelon needs to be used up. Season the juice with sea salt and white wine vinegar and pour into a large pitcher. Add 4 cups chilled water, stir, and serve. How To Add Watermelon, Mint and Basil Water Ingredients To Your Delivery: CSA members - head on over to our online Farm Stand Market to customize your upcoming delivery. The Market is open from noon on Thursday until 10 am, 2 days before your scheduled delivery day. After you confirm your produce items, click the orange button "Confirm and Continue To Other Farm Products" to add the products to your delivery. We are approaching the longest day of the year, and it can be noticed by how early the sun sheds light on the farm. Crews are in the field and working at 5:30 am, quickly trying to get the day’s tasks done before the force of the afternoon heat settles onto everything. The mornings are glorious, cool from the evening, and the colors, crops and wildlife are at their most vibrant. 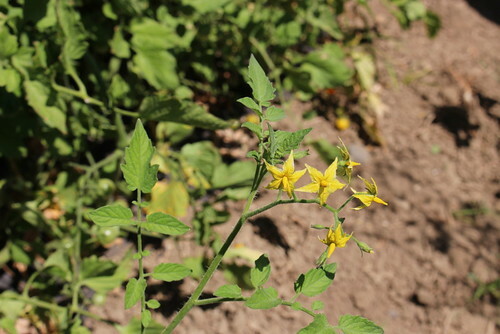 Tomatoes stretch their sticky vines toward the sun with dark green leaves dotted with brilliant paisley yellow flowers. 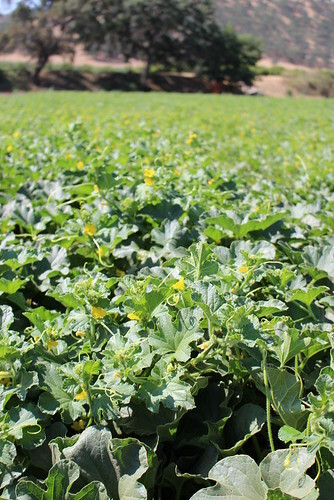 In the field next to them, melons are close to covering the entire field with vines. Above the field, the irrigation canal is running, fast and full to the brim. The water is an olive green as most of it rushes downstream toward all the farms below our farm. Not all the water makes it; we have two pumping stations that each pull water out of the canal and run it through a sand-media filtration system before supplying main lines, which feed sub-mains before being distributed on the water desiring soil through drip tape or sprinklers. At the base of the tomato plants, the soil is mostly tan, but there are spots here and there where the drip system wets the soil all the way to the surface. It is here that the soil is almost black in color. I stick my finger into the mud and ponder the significant difference in soil with or without water. Near the ground is where the tomato plant it the oldest. 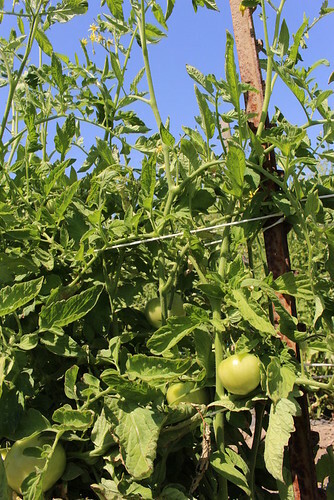 It is here that the little yellow tomato flower long ago came and developed into the crown-set tomatoes – the first, largest and most valuable tomatoes on the vine. This tomato is dark green with a lighter green variegations. I instantly recognize the tomato as Vintage Wine – the dark green on its skin will mature to red and light green stripes will mature to yellow. Slicing the tomato in half, I can see gel just starting to form in the cavities that house the seeds. This tomato will be ready in two weeks. By the afternoon, the farm is mostly done with its work for the day. 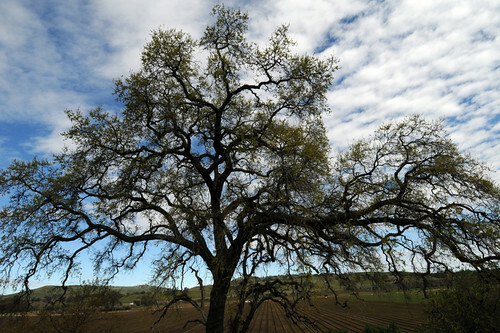 When I walk outside, I do it in sporadic sprints from one shady spot to the other – big trees are the most popular plants on the farm. There is a steady hum from the refrigeration equipment that does not get to go home; it works in the hot sun turning electricity into the cool air that protects our day’s harvest in the cooler before it makes its way out to your homes.